Oceanus 8.50VST from AB Inflatables is a rugged craft providing a safe, com- fortable ride for several hours.The extra- deep V hull and non-submerged tubes provide the boat with plenty of stability, while preventing unwanted friction and spray for smooth, dry operation in calm or choppy waters. The boat features upholstered seating, ample deck space to install ice coolers or additional seating, a smartly designed console with easy-to- reach controls and abundant storage lockers to keep fishing gear secure. In addition, the 8.50VST offers the flexi- bility to be customized to buyers' needs. Weighing 2,860 lbs., the Oceanus 8.50VST has an overall length of 28 ft. (8.5 m) and a 12-ft. (3.6 m) beam. Bottom Tenders. Their lightweight dou- ble-hulled fiberglass construction pro- vides one of the lightest RIB products on the market. Large 17-in. buoyancy tubes on all three models combined with the level non-skid floor (made possible by the full deck liner), offer a stable, durable tender. Lake Tiberias without clogging the cool- ing system with sediment or damaging the drive system. Used for hydrographic survey, this boat achieved a top speed of 29.8 knots on sea trials & cruise of 24 knots. Bullfrog's high quality construction combines the durability of aluminum with the strength of polyethylene for the ultimate combination of safety and dura- bility. Bullfrog's boats are constructed using virtually indestructible, seamless poly- ethylene tubes with internal flotation foam — creating a virtually unsinkable, extremely stable and safe craft with five times the impact resistance of typical fiberglass boats. Bullfrog recently intro- duced the newest member to its product line — the Ranger — constructed to hold up under the most extreme of con- ditions. Chatham Bar 44 footer the Coastguard searched world-wide for a suitable craft, opting for the Halmatic Pacific 32 near shore rescue RIB. The newest rescue boat in the Coastguard fleet is fitted with an enclosed air-conditioned wheelhouse with suspension seating for the crew and is fully self-righting. RIB Directory: A-to-Z Guide excess of 30 knots with the ability to stop within 1.5 boat lengths. Bar area a comprehensive navigation system is essential so the Pacific 32 is fitted with radar, chartplotter and GPS integrated into two computer terminals with displays for the helmsman and nav- igator. A large working area on the stern contains towing braces, a rope winch and a diving platform. In order to further aid its American presence, Halmatic is actively seeking a suitable long term partner in the U.S. to help market and manufacture its boats for the U.S. commercial and military market place. The largest of the catamaran series, it is another addi- tion to Nautica's commercial/rescue line. 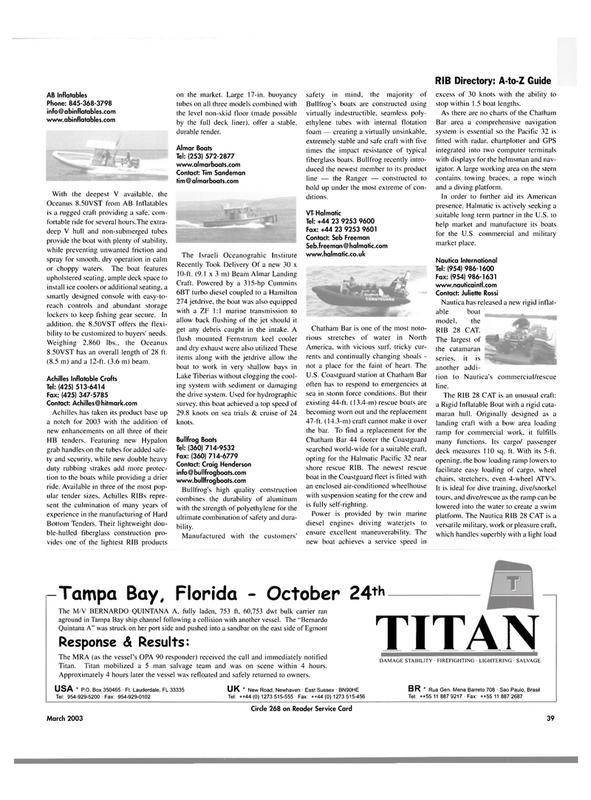 The RIB 28 CAT is an unusual craft: a Rigid Inflatable Boat with a rigid cata- maran hull. Originally designed as a landing craft with a bow area loading ramp for commercial work, it fulfills many functions. Its cargo/ passenger deck measures 110 sq. ft. With its 5-ft. opening, the bow loading ramp lowers to facilitate easy loading of cargo, wheel chairs, stretchers, even 4-wheel ATV's. Approximately 4 hours later the vessel was refloated and safely returned to owners. Circle 268 on Reader Service Card - October 24^ t, 60,753 dwt bulk carrier ran another vessel. The "Bernardo dbar on the east side of Egmont call and immediately notified is on scene within 4 hours.